It was remebered that President Buhari who arrived Ghana on Monday to honor the country’s 61st Independence Anniversary gave a speech as a Guest of Honour. 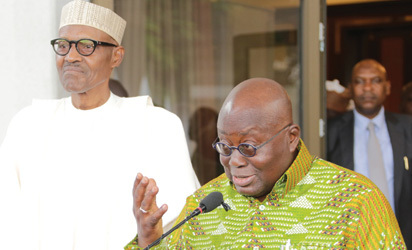 President Buhari while speaking at the Special Guest of Honour Speech during Ghana’s 61st Independence Anniversary Parade at the Black Star in Accra, applauded Ghana’s President, Akufo-Addo and assured him that he will help Ghana fight corruption. “I congratulate you on your efforts to fight corruption which has eaten into the public fibre…Your Excellency I can assure you that you have a good partner in me in tackling endemic corruption,” the President Buhari said. However, in his bid to be of help to Ghana in fighting corruption in the country, Ghanaians have expressed their furiousness over the statement of President Buhari. Many Ghanians who blasted Buhari warned him to leave Ghana with his people who they accused to have corrupted their country. Many others reacting to the statement from Buhari told the President that he should not bring snakes, and monkeys to swallow Ghana’s money.